Designed to make working on ladders safer and more comfortable. Working on a ladder can be difficult, especially when trying to stand on the normal rungs of a ladder. This can be because they are thin and can be uncomfortable on the user's feet, preventing them from being able to commit all of their concentration on the task in front of them. Our ladder tread platform is a great addition to a ladder, providing an easy and affordable way to increase the area the user has to stand on. They are designed to make working on ladders safer and more comfortable. The platform is non slip providing excellent underfoot grip; the support brackets are adjustable for convenience. These tread platforms only weight 1.5kg making them easy to move or adjust. 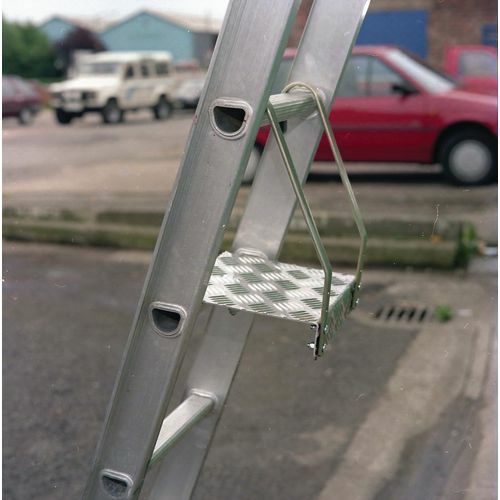 Our ladder tread platforms are a great addition to ladders, providing safety and security. They will help the user to work more comfortably at height and it will assist in the user's ability to concentrate on their tasks.